Among other customs which the Puritans continued to observe in America, after leaving England, was use of the pillory. This form of punishment was intended, among other things, to publicly humiliate wrongdoers. 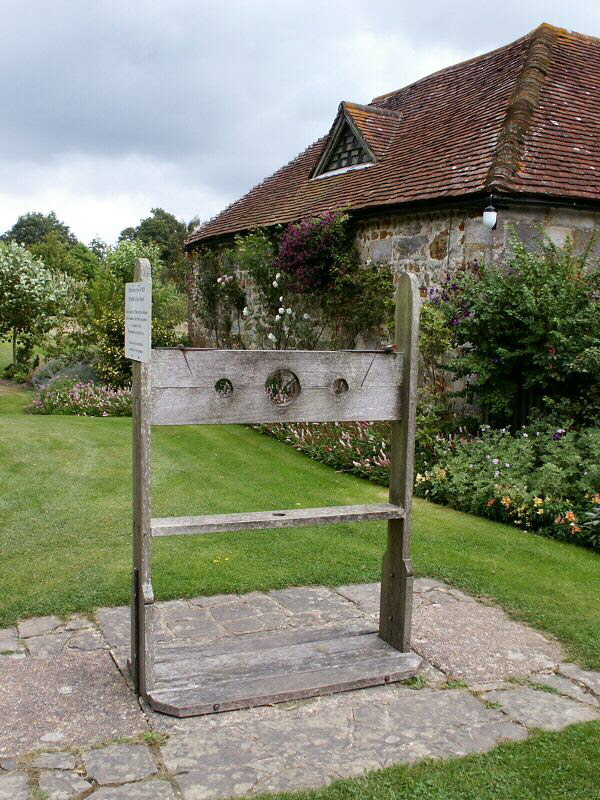 This pillory is located at Michelham Priory in the UK town of Hailsham (southeast of London). Once a place where Augustinian monks lived, this priory has records reaching back to 1229—and—people say it's haunted. Although Puritans left England to escape religious persecution, people living in the Massachusetts Bay Colony were expected to conform to strict, autocratic standards established by the community’s leaders. All of the leaders, of course, were men. Seeking to remain essentially British, as they tried to purify the Church of England from within, the Puritans carried on with certain customs they had known before The Great Migration. One of those traditions was punishment in the pillory. Tracing its history to the 12th century, the pillory was a common sight in towns throughout Britain and on the continent. It consisted of an upright board with a hole in the middle where a person's head was set. As often as not, a person's ears were nailed to the board. Usually there were two openings for hands. Also known as a neck-stretcher, the pillory's purpose was to publicly punish (and humiliate) people for all kinds of offenses. Frequently, a pillory could be rotated, so members of the public could get a good look at the person on display, as depicted by William Pyne in The Costume of Great Britain (1805). The most famous pillory in London was at Charing Cross. Sometimes people locked in a pillory had bricks, or other heavy objects, thrown at them. Not a few died as a result, since they were unable to protect themselves with their hands. Others, like Daniel Defoe (the author of Robinson Crusoe) who spent three days in the Charing Cross pillory (beginning July 31, 1703) for writing a pamphlet (The Shortest Way with Dissenters), were showered with flowers by a sympathetic crowd. Most, however, endured the more usual barrage of smelly eggs and rotting vegetables, dead cats or animal offal, sticky mud and human waste. This type of punishment, at least in Britain, was finally abolished in 1837. How was it used in colonial America? Bos, Carole "HISTORY of the PILLORY" AwesomeStories.com. Sep 01, 2005. Apr 18, 2019.